In 2003, The Zimbabwe Brethren in Christ Church hosted the once-every-six years global assembly of Mennonite World Conference. I (Harriet) had been wanting to attend an assembly sometime, having heard great things about previous ones, and so when the Zimbabwe site was announced, I decided I had to figure out a way to get there. After all, I was born in Zimbabwe. How could I miss this opportunity to accomplish two goals at the same time—revisit the land of my birth and attend a global assembly? For some time in the several years leading up to the 2003 assembly, there were serious concerns about whether Zimbabwe was a good choice of location and whether the church there would be able to manage the significant task of hosting, in light of the serious economic and political instability that plagued the country. As it turned out, the Zimbabwe church acquitted itself beyond all expectations and our Zimbabwean brothers and sisters were wonderfully gracious and welcoming hosts. I count the experience of attending that assembly as one of the highlights of my spiritual life. The Historical Society has been one of the sponsors—along with the Lancaster Mennonite Historical Society; the Sider Institute for Anabaptist, Pietist, and Wesleyan Studies at Messiah College; and Mennonite World Conference—of a series of events in central Pennsylvania in the year leading up to the assembly. For example, Historical Society president, Emerson Lesher, has been leading discussions of the five books in the Global Mennonite History Series. In addition, Historical Society representatives helped to plan the local tours that will take place every afternoon during the assembly. Several of these tours will feature Brethren in Christ locations, including Messiah Lifeways, Paxton Ministries, Messiah College, and the Ringgold Meetinghouse. Devin has been working part-time as editor for Mennonite World Conference, and Harriet will join him as a volunteer with the communications team covering the event in July. This edition of the journal is another way the Historical Society is marking this significant event in the life of Anabaptists from around the world. Nancy Heisey, immediate past president of Mennonite World Conference, follows up on her father’s article in the December 2003 journal reflecting on the assembly in Zimbabwe, and she outlines past and present Brethren in Christ involvement in Mennonite World Conference. Then, Daryl Climenhaga , who has been commissioned to write the history of Brethren in Christ missions and is currently conducting research for this important project, discusses some of the issues and challenges involved in writing missions history. Three major articles feature the Brethren in Christ Church in Zimbabwe. First is a series of stories of women who have been in important in the life and ministry of the Zimbabwe church and a brief biography of former Bishop Danisa Ndlovu, who will conclude his six-year term as president of Mennonite World Conference at the assembly this summer. Bishop Danisa’s story, as well as the stories of the women, are reprinted by permission from a new book by Brethren in Christ authors and sisters, Barbara Nkala and Doris Dube, about the Zimbabwe church. The second article details the beginnings in the late 1950s and early 1960s of Phumula Mission in the West Gwaai district of Zimbabwe (then Southern Rhodesia). The author, David M. Brubaker, with his wife Laona, was the first missionary assigned to Phumula to assist with developing the mission station and oversee the building process. Finally, Elias Moyo, missionary to the United Kingdom from Zimbabwe, tells the story of the development of the Brethren in Christ Church in the United Kingdom, which historically ministered primarily to Zimbabwean expatriates but is now engaged in broader outreach efforts. Also in this issue, in addition to our regular book reviews, is a new section: “Book Notes.” Since we editors frequently receive more books for review than we can successfully assign to reviewers or cover in the journal’s pages, we have introduced this new section in which we can provide brief snippets of books that would otherwise not be reviewed. We hope that the content will be of interest to journal readers. Finally, you’ve undoubtedly noticed that the journal looks significantly different. The publication of this edition is the final piece in our Historical Society rebranding and redesign process. You’ve probably already seen the new logo, the redesigned and renamed newsletter “History Matters,” the new website at www.bic-history.org, and our social media presence. We hope that our efforts to create a distinctive visual identity for the Society and give us a stronger online presence will be welcomed by long-time members as well as help us reach a new generation of people interested in the history and life of the Brethren in Christ. 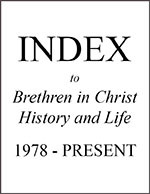 Harriet Sider Bicksler is editor for the Brethren in Christ Historical Society. She also edits "Shalom! A Journal for the Practice of Reconciliation," a quarterly Brethren in Christ publication on peace and justice issues, and is a member of the Grantham (PA) Brethren in Christ Church. She and her husband Dale have two children and four grandchildren. Read more articles by Harriet Sider Bicksler. Devin C. Manzullo-Thomas is lecturer in the humanities and director of the E. Morris and D. Leone Sider Institute for Anabaptist, Pietist, and Wesleyan Studies at Messiah College. He is also a Ph.D. candidate in American religious history at Temple University. He and his wife Katie and their young son live in Mechanicsburg, PA.
Read more articles by Devin C. Manzullo-Thomas.